Sourdough is among the various things I like to ferment. Mostly I do bread and pancakes, but I haven't done these in quite a while. The reason is that a little over a year ago, I moved with my family from Utah to Washington, and my sourdough sponge didn't survive the trip, and I've been putting off making a new one. Well, holiday vacation, I have a few other things I'm making, so I decided to get this going too so I can make some bread to go with the sauerkraut and beer for the new year. I started my relationship with sourdough around 20 years ago when I fell in to a job with a sourdough baking company. I spent about the next decade working in various bakeries, some doing true sourdough, some doing French bread with sour flavoring, and I learned a thing or two. After getting out of that line of work, and being a baker is a lot of work, and going in to technology I eventually got the bug to make sourdough again. That's it. Nothing more, nothing less. It's a long process, making the dough is quick. Proofing the dough ideally takes around 12 to 16 hours, and then you bake it. So, what makes it sour? How does it rise? The sponge, of course. The sponge is the secret ingredient of the sourdough, and it is even more simply made than the dough. Flour and water mixed to a dough, and allowed to ferment. It's the fermentation by way of natural yeasts in the air that create the ability for it to rise and provide the distinctive sour flavor. A sponge is a long living entity. In quality sourdough bakeries a sponge is essentially a trade secret, sometimes hundreds of years old...seriously. The age of the sponge and the yeast cultures gathered from the various physical environments in which it has lived, lend unique attributes to its flavor. A bit of trivia here; Utah, especially around the Salt Lake City area, has been targeted by specific sourdough bakeries because the proximity to the Great Salt Lake tends to give similar attributes to pure sourdough as can be found in traditional San Francisco sourdough that is made near the ocean. In family traditions the sponge is often kept alive and handed down generation over generation so that it can be used over and over again. Why do I bring this up? If you Google how to make sourdough bread you'll get a lot of hits on how to make a starter over night naturally, or more often, using yeast. This is a valid way of making sourdough bread, but it strips much of what sourdough actually is from the process. Sourdough is tradition, it is patience, and it is it's own reward for taking the time to do it right. Put two tablespoons of flour in to a small mixing bowl. Add 1 tablespoon of water. With clean hands, knead until you've created a golf ball sized ball of dough. Cover, and allow to sit in a warm dark place for about 24 hours. Peel off any hard crust on the dough, and repeat steps 1 - 5, adding to the size of the sponge every day for about a week. This allows the sponge to grow freely in flavor and size until you have a usable sponge for recipes. After about a week, cover your sponge and put it in the fridge. This will cause the yeast to slow, possibly go dormant, and allow you to store your sponge without killing it. Ideally you'll be making something with your sponge every week or so. This will involve taking a chunk of the sponge, making a starter overnight, and then making your recipe, but you have to care for the sponge to keep it alive and ready for you when you want to make another recipe. Care for your sponge is easy. The day before you'll be using or refreshing your sponge, take it out of the fridge and put it in a warm dark place (room temperature). The next day take a portion of the sponge for your recipe and/or discard half so that you are simply reducing your sponge by about half. 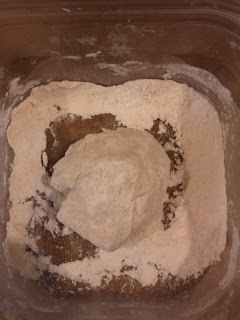 Mix appropriate amounts of flour and water to replace the discarded half. This doesn't have to be an exact science, so just eyeball it. You'll get more accurate as time passes. Cover, and let the sponge sit in a warm dark place overnight so that the yeast cultures can grow and spread in to the new portions of the sponge. Put back in the fridge covered until it is to be used again. It's helpful to throw a small handful of flour in to the container in which your sponge will be stored. This reduces the sticking to the sides of the bowl, and makes it a little easier to work with. That's really all there is to creating and feeding a sour sponge. Maybe it's a little more involved than going to the store, or making a quick starter with yeast, but the doing for the sake of doing, and enjoying for the sake of doing adds a little bit of zen in a hectic world hell bent on instant gratification.